Attention Medical Providers, Mental Health Professionals, and Support Group Leaders! 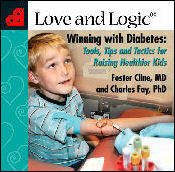 Our publisher, Love and Logic, is offering special pricing for hospitals and medical clinics. This is a great opportunity to purchase copies for your patients and special needs support groups. *Pricing and availability are subject to change so order soon! To order discounted copies, please call Love and Logic at 800- 338- 4065. There is no minimum for the discount, single copies are also available through Love and Logic. International shipping is available. Are you a support group leader? Be sure to check out our FREE study guide. 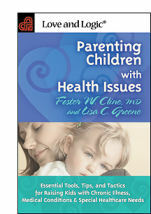 As a companion to the book Parenting Children with Health Issues, it includes 3 to 5 questions for each chapter. Good for individual and group study. CLICK HERE FOR FREE DOWNLOAD. This 342- page book has received three awards and numerous favorable reviews from medical professionals, non-profit organizations, and (most importantly) parents who are raising children with medical conditions. You can find these reviews under the “Awards and Reviews” tab of this website. The discounted cost per book is $17.47 (List Price is $24.95). Shipping costs additional. Thank you for your interest in providing copies of this important book to your patients and colleagues. We know you will find it to be a great help in your work with families. To order your discounted copies, please call Love and Logic at 800- 338- 4065. How Do Children Really Learn Responsibility? The discounted cost per DVD is $27.97 (List Price is $39.95). Shipping costs additional. Order this product directly through Love and Logic at 800-338-4065. We have received numerous letters of appreciation from parents and professionals for the book "Parenting Children with Health Issues" and many requests for a short, concise version which can be handed out in doctor's offices, support groups, etc. This fun little booklet will give you the Love and Logic basics for parenting a child with special needs. 112 pages; illustrated. Available in Spanish, too. The discounted cost per book is $5.57 (List Price is $7.95). Shipping costs additional. Thank you for your interest in providing copies of this resource to your patients and colleagues. We know you will find it to be a great help in your work with families. This fun little booklet will give you the Love and Logic basics for parenting a child with special needs. 112 pages; illustrated. It's not easy to get a child to take medication. We all know what happens when we say, "Here, take this pill!" Whether a child is taking a one-time course of antibiotics for an ear infection or needs to take medication regularly for a chronic condition, medical adherence is critical. The better children can be at taking their medications as prescribed, the more likely they are to get better and/or stay well. 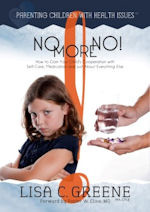 Kids of all ages from toddlers to teens will be more willing to take their medication and do medical treatments when parents and medical professionals use the tools in this book. The discounted cost per book is $5.56 (List Price is $6.95). Sales tax and shipping costs additional. To order your discounted copies, please call Lisa Greene directly 425-298-7197 or send her an email. Learning how to make good decisions starts at an early age. Created to be enjoyed together, this work will help adults guide and encourage children to understand the consequences of healthy and poor choices. Beautiful illustrations and a hidden frog on every page will capture the attention of young readers and bring the stories to life. Exploring this book with children will empower them to develop a foundation for healthy living. We offer bulk sale discounts shipped directly to you as well as the opportunity to include your company logo on the inside cover page. Contact us for pricing. Does your child have diabetes? Join parenting experts Foster Cline MD and Charles Fay, PhD in an engaging discussion about how to raise happy, healthier children with diabetes. Included are bonus discussions with Dana Hardin, MD, a leading pediatric endocrinologist and Sarah, mom of a child with diabetes. The discounted cost per CD is $8.37 (List Price is $11.95). Shipping costs additional. Shipping costs are additional. Now Available! Order this product directly through Love and Logic at 800-338-4065.